The governance design of the IoTeX network encodes the rules and processes that define how the network will reach consensus, incentivize network participation, and evolve sustainably over time. In this blog post, we provide an overview of the IoTeX Delegates Program, focusing on application, voting and election guidelines. To apply to become an IoTeX Delegate, please review the minimum requirements and complete this form. IoTeX is committed to building a decentralized and inclusive ecosystem. As a digital democracy, IoTeX acknowledges and rewards community contributions in various ways. Delegates elected by token holders represent the entire IoTeX network by maintaining consensus, spreading project awareness, organizing community-wide initiatives, and more. Member: any voter that stakes at least 1,000 IOTX becomes a “Member”. All members will receive member-only benefits provided by IoTeX ecosystem partners and affiliates. 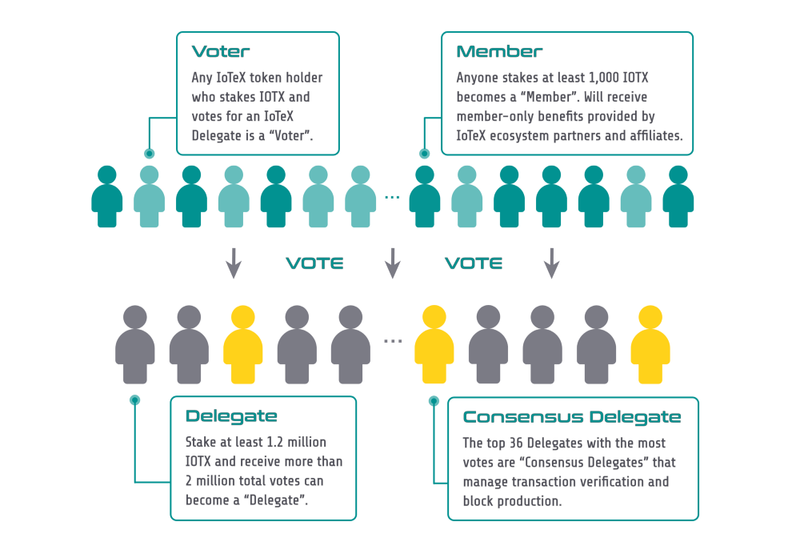 Delegate: any token holder who stakes at least 1.2 million IOTX and receives more than 2 million total votes is a “Delegate” in the IoTeX network. The top 100 Delegates with the most votes will receive variable rewards based on their total weighted votes. Consensus Delegate: the top 36 Delegates with the most votes are “Consensus Delegates” that manage transaction verification and block production. Consensus Delegates receive fixed block rewards for every mined block in addition to the variable rewards shared by all IoTeX Delegates. In return for their services of maintaining the IoTeX network, all Delegates are rewarded with IOTX. Out of the total 10 billion IOTX token supply, 12% (1.2 billion IOTX) is reserved for Delegate rewards. 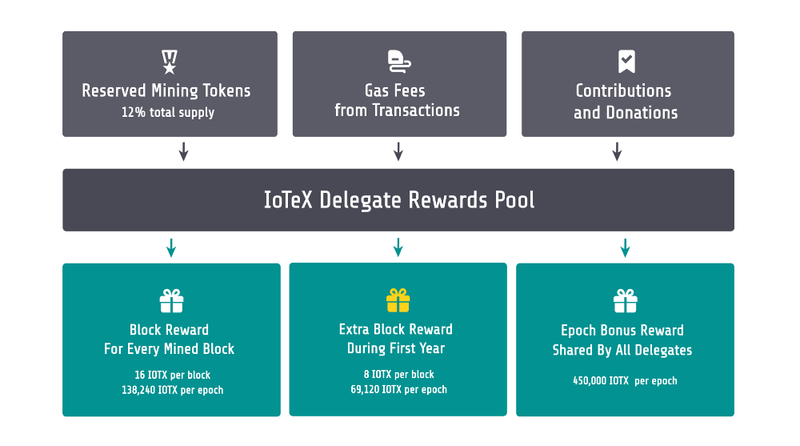 The reserved mining tokens, all gas fees from transactions, and contributions / donations from the IoTeX Foundation and community make up the IoTeX Delegate Rewards Pool. Block reward (fixed): for every epoch, 24 of the 36 Consensus Delegates are randomly selected to produce blocks and receive 16 IOTX for each block mined. As an epoch is currently 8,640 blocks (one day), a total of 138,240 IOTX is issued as block rewards every epoch. Extra block rewards during first year (fixed): during the first year of the IoTeX Mainnet, an additional 8 IOTX for each block mined will be provided by the IoTeX Foundation. Epoch bonus reward (variable): an epoch bonus of 450,000 IOTX will be allocated to the top 100 Delegates based on weighted amount of votes. The IoTeX Delegate Rewards Pool is designed to incentivize the maintenance and growth of the IoTeX network. Delegates may choose to share rewards with their voters — this is ultimately the choice of each respective Delegate. Accumulated transaction fees collected from a thriving IoTeX network will be able to replenish the rewards pool and continue to incentivize block production for decades. A token holder must self-stake at least 1.2 million IOTX to become a candidate. All candidates are eligible to receive votes and will be listed on a candidate ranking page. A candidate will become a Delegate after receiving more than 2 million total votes (self-votes + votes from others). At the end of every epoch, the top 36 voted Delegates are defined as Consensus Delegates for the next epoch. To remain eligible, all Consensus Delegates must maintain the minimum HW/SW/Ops requirements and a productivity ratio (mined blocks / total) of at least 90%. To apply to become a Delegate, please complete this form. To participate in the voting process, voters will stake IOTX tokens via smart contract. Voters will receive one vote for every IOTX staked (1 IOTX = 1 vote). Those that show long-term commitment by staking for a specified duration will be rewarded with “bonus votes” based on the graph below. An epoch in the IoTeX network is currently defined as 1 day (8,640 blocks). Voters can choose any 14-epoch interval as their stake duration (i.e., 14, 28, 42 … 350), with increasing bonus votes for longer durations. For example, staking for 14 days generates a ~15% bonus (100 IOTX = 115 Votes), while staking for 350 epochs generates a ~32% bonus (100 IOTX = 132 Votes). Voters may unstake their IOTX after the stake duration expires. The unstaking process lasts 3 epochs, after which the originally staked tokens will be available to withdraw to their wallets. With one wallet address, a voter can vote for multiple Delegates using different stake amounts and durations. 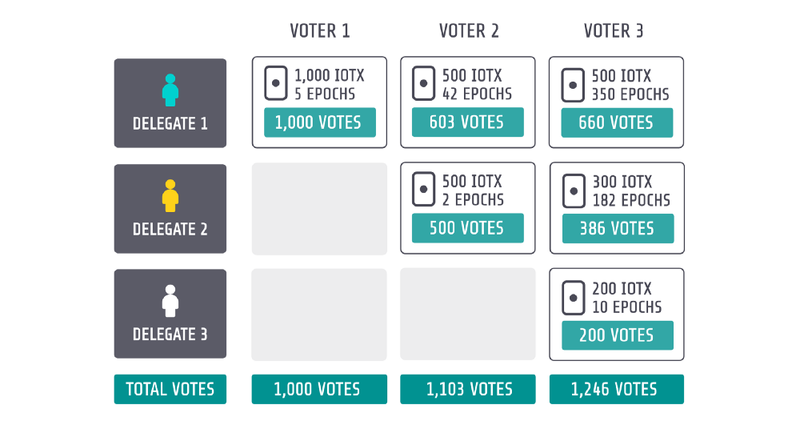 As shown in the example below, each voter stakes a total of 1,000 IOTX and votes for different Delegates. The difference in total votes across the voters is due to bonus votes from staking for different durations. After the initial voting process, votes can be redirected to a different Delegate and/or the staking duration can be extended at any time. We encourage all potential Delegates to campaign, publicize their contributions to the IoTeX network, and earn votes from voters. We encourage all token holders to participate in voting and elect Delegates that are trusted, committed, and beneficial to the IoTeX network. To securely bootstrap the IoTeX Mainnet, the total amount of staked IOTX must account for at least 20% of the circulating supply. After the network is bootstrapped, Mainnet Phase I will commence and “Robot Delegates” will work alongside elected Consensus Delegates to produce new blocks. Robot Delegates will be algorithmically driven and will not receive any epoch bonus rewards. The number of Delegates and associated rewards for Phase I and the subsequent Phases II & III are summarized in the table below. Through months of research and detailed design, we are confident that the IoTeX Delegates Program design will drive a healthy IoTeX ecosystem and fulfill our guiding principles of Participation, Evolution, Growth, and Sustainability (PEGS). In the coming weeks, IoTeX will release mobile and web applications to facilitate the staking, voting, ranking, and rewarding processes. As we ramp up the IoTeX network throughout 2019, we will work closely with Delegates to ensure the IoTeX network is secure. This governance model may be refined and evolved as the IoTeX network grows. The Delegates election process will kickoff in February 2019 and the IoTeX Mainnet Alpha is expected go live in March 2019 — get excited! If you are interested in becoming a Delegate, please review the minimum requirements and complete this form.